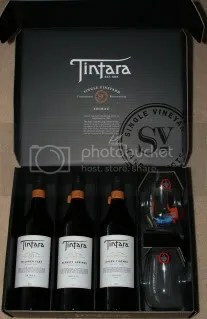 For those that read last weeks entry regarding Mclaren Vale’s Tintara Cellar Door and the Tintara wine range then thanks for comming back to see the rest of the Tintara Cellar Door wines. For those that did not see that posting then please check it out while you are at this blog. 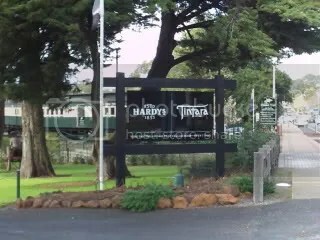 Remember the web address is www.tintara.com.au. What a great idea – take the best fruit from 3 excellent producing vineyards in the one wine region. Choose the grape variety that best reflects the region – in this case you could not go past Shiraz for Mclaren Vale wine. Give the grapes the best treatment but keep the winemaking practices the same for all 3 fruit parcels. The outcome a series of classy wines that that are showcasing the Mclaren Vale regions standout variety plus can be used to compare the efect of different vinyards – the soil, the vine age, the elevation of the site, the different grape clones and the aspect of the vineyard to the sun. The winery provided information indicates the fruit was hand picked, destemmed and spent 10 – 12 days in open topped fermenters. The caps were hand plunged to provide the desired flavour and tannin extracton. After fermentation the wine was basket pressed and matured in french oak for 20 months. You can taste these wines in a structured tasting at the cellar door. this tasting costs $A10 which is fully refundable when wine is purchased. The tasting is at a separate table with photos of the vineyards, gasses of wine display the soil from each vineyard and comprehensive tasting notes. The tasting is conducted using the Riedel “O Wine Tumblers – Shiraz” that do not have the usual glass stem. The tasting I had consisted of 3 large tastes at the same time which enabled me to taste one at a time and go back so to compare and check for flavours – I enjoyed the experience. If you purchase the 3 pack of the 2004 SV wines, 2 of these glasses are included in the pack. I even bought 4 extra glasses for a dinner party set. When I found out about these wines I could not wait to try these wines and I have a set put aside for a dinner party with some wine loving friends in a few years time. A classic Mclaren Vale Shiraz, powerful with plenty of spices (allspice and cloves) mixed with plum fruit characters. Complex, rich with a long finish. This vineyard has the highest elevation of the 3 vineyards and is completly dry grown as there is deep moisture available throughout the year. A very aromatic wine (spice, plums and chocolate). This aromatic character is why I like this wine the best, but only just, of the 3 SV wines. The palate is soft and full of spice and plums. This vineyard is only 300m from the Blewitt Springs Vineyard and highlights differences of vine age, vineyard aspect and the cooler site. The wine has a complex aroma with hints of plum conserve (or paste), tar and lots of spice. The palate is a mixture of olives, spices and chocolate. The fine tannins also provides a great lingering flavour when swallowed. It is difficult to give justice to the differences between these classy reds. After trying (and buying) them I believe the only real way to give justice to these wines is to try them. 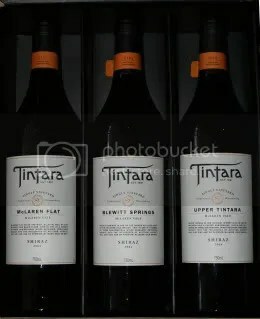 As such my real recommendation is if you find your way to the Tintara Cellar Door then it is worth the $10 investment in your wine experience to try these wines (even if you do not purchase them). Lovin’ the info, the blog’s coming along nicely! Thanks for the feedback. Let me know if there is anything specific you may be looking for about Mclaren Vale & I will attempt to find out about it.